We all concentrate on the look of our homes when carrying out the maintenance, such as painting the outside, clearing the guttering, wiping down our UPVC windows and doors, but one of the most critical elements of maintaining a park home is the underneath. If that fails then this could cause significant damage to your home. 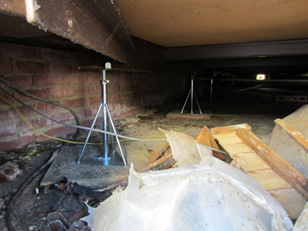 In most cases regarding park homes the concrete base is the responsibility of your park owner, however the tripod jacks that your home sits on (if you are lucky to have jacks and not wood blocks, or concrete bricks) are one of the most critical elements to the structural integrity of your home. 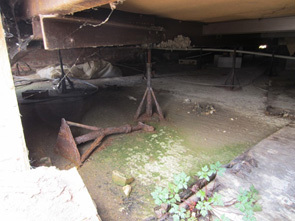 If you are unfortunate to have a support like this under your park home (this was a home we were asked to provide finance on, when we provided Park Home Finance), then you really need to get this changed As Soon As Possible. The problem with wooden supports is that they rot, they can be flexible and in this particular case they will transfer damp from the ground and into the floor joist. When this support fails, so will the floor drop, and if the support has transferred moisture into the floor joist, that too can fail. picture. They don’t look like the most stable of bricks and stone and the likelihood that this support is millimetre perfect is highly unlikely meaning that either there is a gap between the top brick and the chassis meaning the chassis is flexing and probably knocking, or the chassis was forced onto the bricks which means it might not be straight. It is sad to see however that whoever sited this home obviously scoured the park to find suitable stones, rather than was prepared for the homes arrival. OK, so here we nearly have the correct jacks in place, but as can be seen they have not survived through time, and are heavily corroded and could fail at any time, resulting in the home dropping significantly, likely to cause significant damage to the chassis and the internals of the home. It is worth pointing out that should this happen, any damage would not be covered by a Park Home Insurance policy as this is a lack of maintenance issue and not an insured event on a Park Home Insurance Policy. Do your jacks look like these? So what happens when the support to a Park Home Fails? 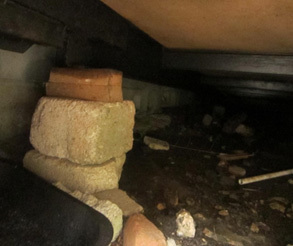 The photos here show the consequences of the supports failing under the home. It is possible that only one support will fail, but at the same time the weight of the home will be forced onto other supports, or onto the brick skirt, as shown in these photographs. The floor in the inside of the home will become un-even and for those not confident or sure on their feet could end up tripping over the un-even floor and cause themselves a personal injury. For those of you who own twin units, it is possible that one half will drop, but the other stay in-situ, resulting in the chassis twisting or cracking at the point where the two halves are bolted together. This will then further affect the internals of your home with large cracks to the walls and ceilings and where they meet also. To resolve the matter, the brick skirt will need to be removed, and the home jacked up again (assuming that the chassis isn’t damaged as a result) and replacement jacks re-installed once the home is levelled and then lowered again. Then there is the cost of the re-building of the brick skirt around the base of the home and the repair of any internal damage as a result of the home dropping. Alternatively you can make sure that this doesn’t happen by some very basic maintenance. However, the maintenance should not be carried out by yourself, and you should have professionals come ad do this work on your behalf. If you do not have the correct supports under your home, or they have not stood up well with time, you need to consider replacing them with Galvanised tripod jacks. These jacks do not rust, and they are merely there to act as a support. With their screw adjustment they merely are wound to make contact with the chassis, and not to lift it. 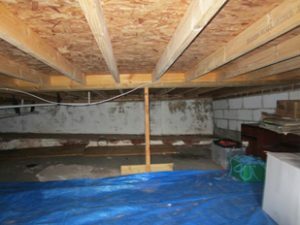 This is not expensive maintenance, but you should not consider going under your home to do this yourself, you should get a speacialist team to carryout the work on your behalf. If you are wary as to who to contact, then please call us and we will be happy to recommend, contractors we use for our day-to-day insurance claims.